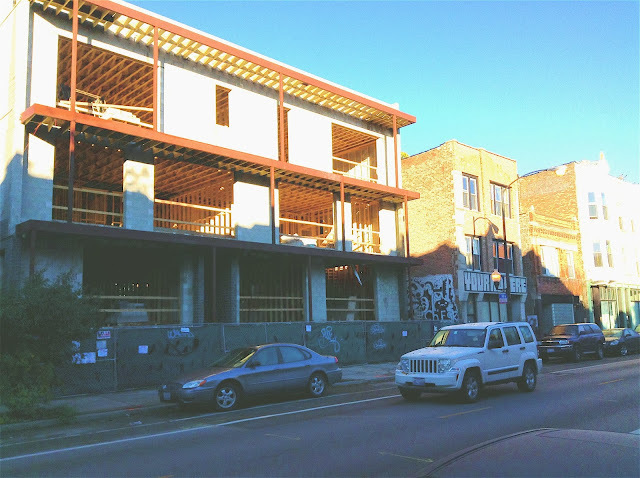 East Village Association | West Town Chicago: Development's shadow over East Village: Your ideas? Development's shadow over East Village: Your ideas? The East Village is a beautiful neighborhood that is diverse in both people and architecture. However, as others have recognized the beauty of the East Village we have lost some of our diversity both in our people and our architecture. The board of the East Village Association is seeking to explore ways of promoting diverse and responsible development. Too often families that are longtime owners of beautiful and historic homes are offered no opportunity to sell their properties other than to a developer who will demolish the existing structures. Likewise many developers of larger remaining parcels seek zoning changes to accommodate more high-priced one-bedroom and studio apartments. These all-or-nothing propositions create a monochromatic East Village and undermine characteristics that make our community so attractive. How can we preserve our existing historic housing stock? How can we control the expansion of new condominiums so as to preserve our historic structures and create greater value for existing condominium owners by preventing oversupply? What incentives can we offer existing property owners to provide greater choices other than a sale and ultimate demolition? What tools can we develop to encourage and convince developers of larger parcels that a glut of studio rentals is neither economically feasible or in the interest of the community? What tools can we develop to encourage the preservation and development of green space? In the past these type of questions have tended to result in calls for more restrictive zoning, But there are other tools available that may create a larger more diverse group of persons and developers interested in investing in the East Village. These tools include renovation zoning, zoning overlays, buffer zones, a determination of high-density versus low-density zones, pedestrian designations, expansion of the historic district and renovation and green space incentives. There are more but we are looking for good ideas from the community, the city or any other source. Join us at the our next general membership meeting at 7pm Monday in the Happy Village, 1059 N. Wolcott Ave., to begin the discussion and planning process. The East Village Association wants to embrace the future and honor our past. This is a very important issue. I have been watching it happen on my street, and am sad to see the diversity leave and the neighbors looking more and more like me. I realize the irony of being a gentrifier who doesn't want the diversity boat to tip, but i think the best communities have a mix of housing options, price points, and people. It is what attracted me to Noble Square years ago. I also understand that some of my neighbors want to be able to cash in on their life's investment. One neighbor plans to sell his house and retire in his native Mexico. And the 4-story luxury condo building will follow. I don't know what the solution is...beyond waiting for our windfall and finding a new neighborhood. While I agree with the preservation of historic buildings, I don't agree that studios are inherently bad options for rental housing stock, and don't really see why they're in the same list. It's not like there's a glut now, and I don't foresee a glut in the future -- the vast majority of the apartment stock in the area is two-bedrooms and larger. I think presenting it in this way is a little disingenuous -- I don't see it as a fact that studios are not "in the interest of the community."